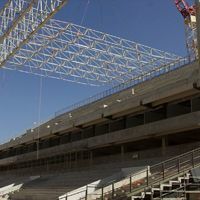 The 83-ton steel truss was yesterday mounted atop the northern stand of Arena Pantanal. Four more will cover this stand, while overall surface of the roof is to reach 25,600 sqm. First it had to be put together on the ground. Then the big lifting operation took place at Arena Pantanal yesterday with a mobile crane carrying the 83-ton steel truss onto the giant frame supported in two corners. Similar operation will be done several times more from now on, as each end stand will receive three large segments and two smaller ones, as indicated on the image (left). Once all trusses are above stands, they are to be covered with 25,600 sqm of membrane sheet.